The value of an attractive smile should not be underestimated! This patient is wearing the "new" invisible braces. Our office offers the latest advancements in invisible orthodontic braces. This newest development in orthodontic technology allows you to smile with confidence throughout treatment. Correcting your smile is possible at any age. 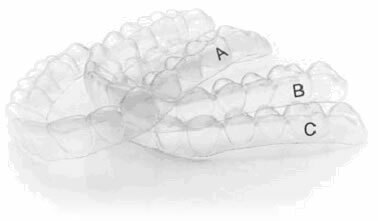 Some patients may choose the new clear braces or invisible tooth aligners. Mystique, which uses the latest aesthetic ceramic technology, provides outstanding results and high translucency. 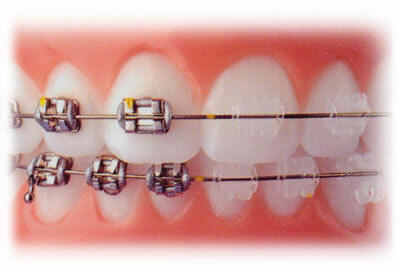 The clear braces are bonded to the tooth just like the ordinary metal braces. Treatment time with the mystique is approximately 12-14 months depending on the difficulty of tooth movement. Adults are asking for invisible (clear) braces today. This patient is wearing invisible retainers. The easy three tray tooth aligner series, is designed for minor tooth alignment of the upper and/or lower front teeth. A slight amount of the outside part of the tooth may have to be removed between the teeth, creating a tiny space between the teeth and allows to tooth to be lined up while wearing the tray. The tray is to be worn 24 hours per day and only removed when you are eating. The dentist will determine the length of time necessary for tray A, B or C.
If you have some minor crowding and have always wondered whether you could have them straightened without braces, contact our office today to see if you may be a candidate.